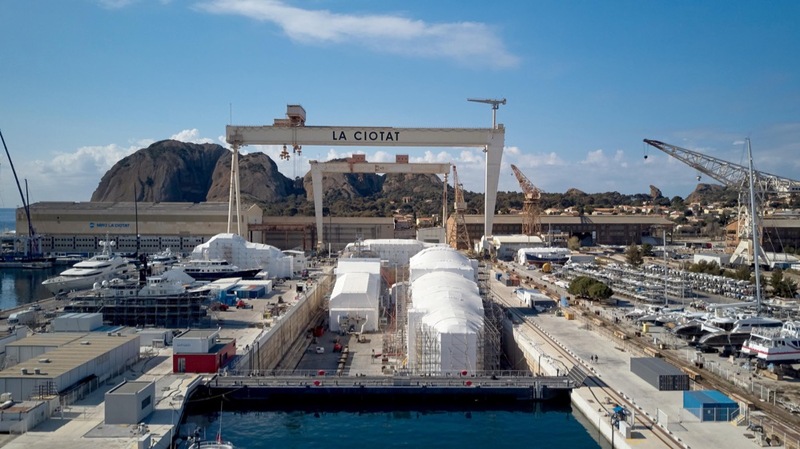 MB92 La Ciotat announced today the signing of a contract with La Ciotat Shipyards extending its occupation of the 200m dry dock for another three years. The agreement gives them exclusive rights to the dock until August 2022. Ben Mennem, CEO of MB92 La Ciotat, is delighted with the arrangement. “This contract unlocks several important orders, which we had to put on hold, and accelerates the development of our business locally,” he says. The contract should also create new jobs locally which will come as good news to the area’s residents. MB92’s role in the large superyacht refit sector contributed to La Ciotat Shipyards decision to renew the agreement. With regards to activity at the facility, Mennem reports an increase in the 80m+ market, in which MB92 La Ciotat has undertaken 45 projects over the past two years. “This is clearly a very good win-win deal, in line with the partnership spirit promoted by LCS towards the re-industrialisation of our yard and the creation of a skilled workforce,” comments La Ciotat Shipyard’s director, Jean-Yves Saussol. Since its inception in 1998, MB92 La Ciotat has delivered over 1000 projects and managed refits for over 25 per cent the world’s 85m+ fleet.